Dimensions: 11 3/16 x 15 5/8 in. 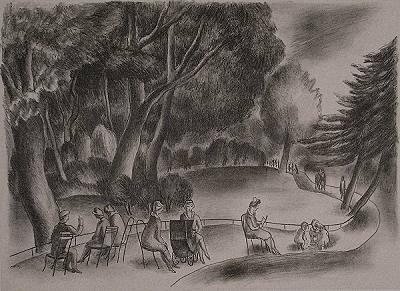 *Title: Fiene's title Anglicizes the name of the Parisian Parc Montsouris, a favorite haunt of artists and writers, especially American expatriates during first few decades of the Twentieth Century. Hemingway's archetypal expatriate Jake Barnes in The Sun Also Rises (1925) visits it with the novel's anti-heroine Brett Ashley. To read more about the Parc Montsouris, click here. Fiene, like so many young American artists, undertook pilgrimages to Paris. On one of his very early visits in late1928 and 1929, he made prints, including this one, at the Atelier Desjobert. **Impressions outside the edition: At least one unnumbered impression has been observed. Except for the absent numbering, its annotations are typical. **Annotations: The chine collé impressions are generally signed on the backing sheet just below the pasted top sheet, but not always.